My dividend numbers are also off to a great start. Typically, February isn't a big month for me. However, this year it completely surpassed all expectations. I am proud to announce I have achieved a new monthly dividend record! February dividends add up to $171.45 which represents an increase of 117.4% from last year where I made $78.85. This year is off to a great start. Already two months in the books. My dividend numbers are also off to a great start. Typically, February isn't a big month for me. It is the shortest month of the year after all. However, this year it completely surpassed all expectations. I am proud to announce I have achieved a new monthly dividend record! February dividends add up to $171.45 which represents an increase of 117.4% from last year where I made $78.85. Below are some charts from my portfolio page to better visualize the results. How did I achieve such big growth? As you can see from February 2018's dividend post, I was paid dividends from 7 companies. 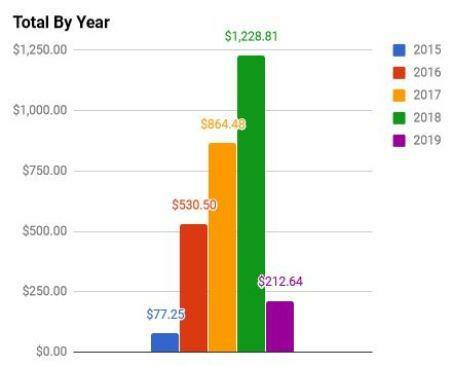 This year I was paid by 8. HCP payments tend to fall near the end of the month so sometimes the dividend payment shifts over into March. That is what happened last year. However, this year HCP paid out in February making growth numbers look larger. So this isn't necessarily growth, since it just changes months and we will realize the decrease to offset it next month. All other companies remained constant, but I did add to a lot of positions over the last year which increased their dividends. I doubled my position in T. I also added to my ABBV positon multiple times throughout the year which increased the dividends paid from them almost tenfold. Adding to these positions probably made up about 60% of my gains this month. Other than what came from the HCP payment, the rest of the dividend gains came from good old-fashioned dividend increases and reinvesting. Have to love seeing organic growth. I am ecstatic with the results for February. Over 100% increase and a new monthly dividend record. It is still early in the year as well, so plenty can happen. Can't wait to see what March and the first quarter ending month brings! How did your portfolio perform in February? Did you achieve any big growth? Any companies you're looking to buy right now? Your comments are always welcome below.